Knowledge of Wire Work is required. A wire wrap designed to capture your special treasures - not a bead, not a cabochon… not a problem. 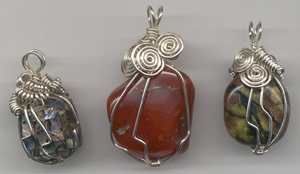 This wrap design traps your favorite rock, shell, fossil, marble or found object in a cage of wire. Learn to make a double bail, and simple embellishments to finish the project.